The Marketing for Zoolander 2 is So Hot Right Now! I don’t know about you, but Zoolander is one of my all-time favorite movies. Not only is the cast amazing and it’s just so ridiculously funny, but it meshes one of my other loves – fashion. The way cross channel marketing of upcoming film, Zoolander 2, has managed to seamlessly integrate its promotion into the fashion industry really makes me geek out about what I do. It has been almost a year since the news hit the runway (literally), about the sequel of cult classic, Zoolander, being in the works. This was no average press release though. Main characters and fashion icons, Derek Zoolander and Hansel (played by Ben Stiller and Owen Wilson), strutted their stuff during the Valentino show at Paris Fashion Week on March 10th, 2015. Since then, there has been a slew of teaser trailers, promotional ads, and more – that have made sure to meld with today’s multi-billion dollar beauty and fashion industry. For example the cover of Vogue and ads that appear to be for perfume named No.2, cleverly drawing inspiration from Chanel’s real fragrance, No. 5. Derek Zoolander and Penelope Cruz on the 2016 February cover of Vogue. Subtle ads appearing to be for No. 2 parfume – including a hilarious parody ad. You can see more ads and catch the whole spot here. Samsung ran a sweepstakes offering consumers a chance to work the Zoolander 2 red carpet event in New York as official fan correspondent for Entertainment Tonight. Fiat featured Derek’s famous Blue Steel during their 60 second spot for 2016 Fiat 500X, which premiered during the 2016 Golden Globes. Watch the whole spot here. Most recently, Derek and Hansel were seen posing as mannequins in the Valentino store window in Rome on Sunday. With less than two weeks until the February 12 opening of Zoolander 2, I think it’s safe to say that we are all in anticipation to see if the highly awaited sequel will live up to the first, and all of the marketing hype!! Paparazzi snapping shots of Zoolander 2 stars as they pose in Valentino’s store window. You always hear about the interest and targeting of the millennial marketing segment, but even more influential is the Latina population within it. 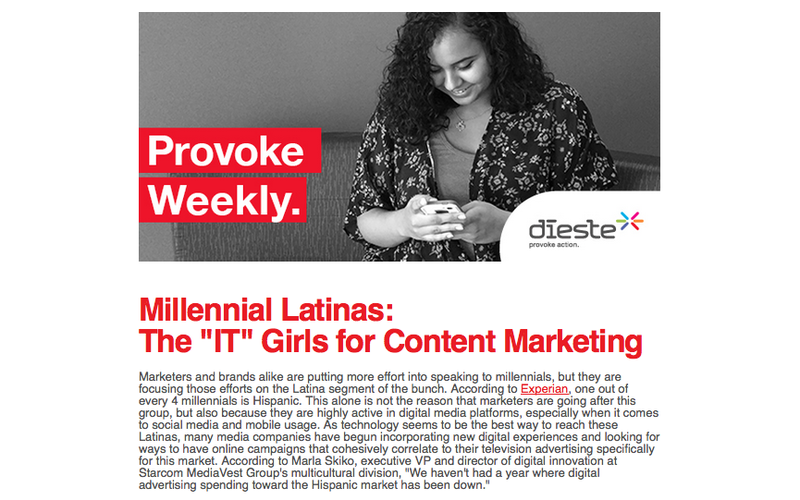 To read more about the impact that millennial Latinas are having on brands and marketing – check out some of my article below, and to see the full article go to Dieste’s Provoke page now! I’ve definitely met my fair share of people that think blogging isn’t a big deal, but I am hear to tell you, that it is not only surprisingly profitable (if you are doing it right), but it can also make a difference in aspects of community and culture. 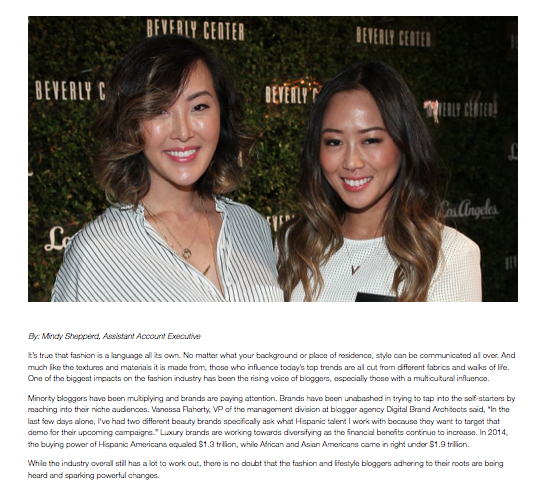 As a blogger, fashion addict, and Latina – these influential people catch my eye! It’s an amazing thing that is happening and I’m excited about where things are headed – especially in the fashion world. To check out the whole article on Dieste’s Provoke Daily, and see the source article from Fashionist, check it out here! Digital Closets, Fashion Illustrations & Tinder for Shopping – Oh My!! I think it’s pretty clear I like Fashion, and much like other millenials and younger generations, I am naturally enthralled with technology. In this article, I wrote for Dieste’s Provoke Weekly publication, you can find out some of the ways you too can be fashionably tech-savvy in a big way! I give you the run down on apps like LiketoKnow.it, Mallzee, Stylebook, and Chic Sketch. Check it out now! For every 90’s girl that was ever envious of Cher Horowitz’s closet, now you can with Sylebook!